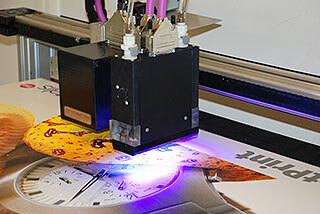 Opti Temp's cooling systems are used to cool the latest large scale commercial digital printers. This is the fastest growing area of the printing and publishing industry. These large high-speed digital printers are used by many of the larger printing companies to afford quick set-up and printing in minutes or hours, providing quick turnaround. Digital printing requires specialty inks designed for this market and a UV light source is used to “set” the ink for quick drying. Mercury and LED UV sources create heat and require cooling systems for thermal management. 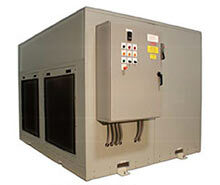 These air or liquid cooling systems incorporate fluid based chillers and heat exchangers. A chiller or heat exchanger is the component that removes heat from the UV source and they are the most important device used in managing temperature for the commercial printing industry. Opti Temp's industrial chillers and heat exchangers insure high quality performance and long life of commercial digital printing systems. Our Chillers and Heat Exchangers, Portable Chillers and fixed mount Chillers are completely self-contained and able to serve the purpose of removing heat from the UV source. 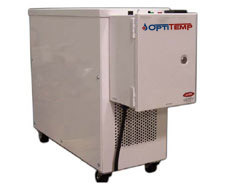 For over 20 years Opti Temp has been designing and manufacturing Fluid Chillers and Heat Exchanger equipment for digital printing applications, working with OEM’s that integrate our chillers into their commercial printing systems. 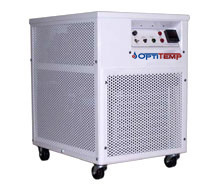 Opti Temp designs and manufactures standard cooling systems or, if needed, Opti Temp can design a custom chiller or heat exchanger to customer requirements for size, portability, operating conditions, thermal load and system footprint. Designed for the industrial environment with a long service life in mind these chillers and heat exchangers are recommended for all digital printing processes.